I had run a 10K back in 10/2013, and it was then I decided I would start training for a half marathon. 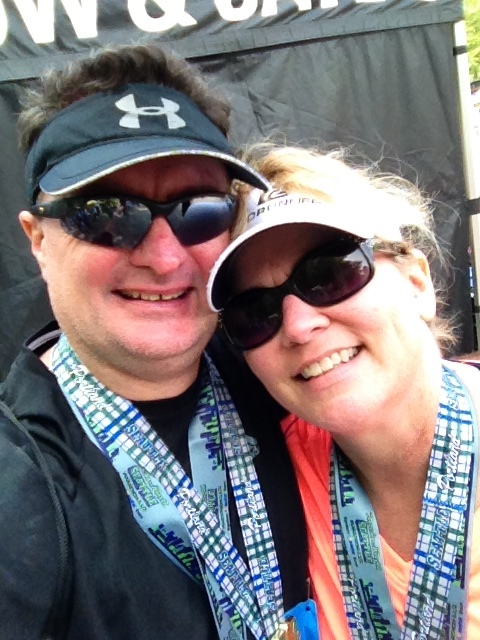 I was aiming for the Lake Sammamish Half for March, but after a little discussion with The Motivator, we decided my first half should be Rock ‘N’ Roll Seattle, 6/21/2014. Pre-Seattle race, I remember being a basket case. The nerves were out of this world. And the RNR events are huge, so the amount of people that were there freaked me out as well. But everyone else looked so calm. Thankfully James stayed with me for as long as he could so I wouldn’t bail (lol, kidding). It probably took me about 5 miles in before I relaxed. The course was gorgeous (and super hilly), and I felt privileged to be able to run in areas I wouldn’t normally get to see. Back then I didn’t carry my phone with me, just my iPod for music. So, no pictures. I made a mental note to carry a camera with me on the next race. This was before blogging, so that didn’t happen. There are a lot of races I missed out on taking pictures, and I’ve seen some amazing sights. It’s also one of the reasons why I’m running the 50 states… for the sights. Everyone else chases PRs… I’m there for aesthetics, lol. And I’ll never forget the feeling of accomplishment I had when I finally crossed the finish line. There is nothing that compares to it. It’s why I’m addicted to racing… and, oh yeah, the bling. I have since run 10 more half marathons and am now training for my first full. I can imagine the above feelings are going to be escalated out of the stratosphere. 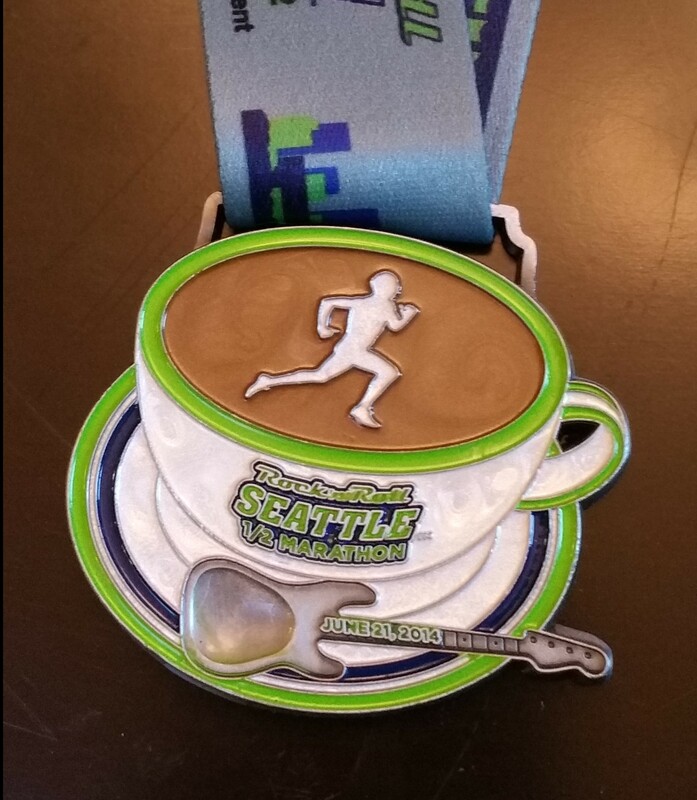 This entry was posted in Races, Running and tagged beginning running, bling, diet, fitness, Half Marathon, healthy lifestyle, Pacific Northwest, Philippians 4:13, RNR Seattle, Rock n Roll Seattle, running, Seattle, training, weight loss on June 29, 2017 by Paula. I’m sure that you can do it !! I agree about running for the sights. I so enjoy the scenery hence I love the hills. You have a good trainer I’m sure that you will succeed! It took me a long, long time before I started taking photos during racing (and thank you, run/walk intervals that make it far easier for me to do so). I, too, remember running a 10k and thinking no WAY am I ever running twice this distance. Bwahaha. Holly tells me that a marathon is not like running 2 halfs . . . I still don’t believe her. But I know you can do it, Paula! Nope, I can’t imagine! I’ll live vicariously through you. Of course, once you go over to the dark side, 13.1 becomes nothing. I don’t get that either . . . .
Well, at least you can pick James’ brain. I do think every distance has its challenges! I know you can do it!! You’re motivated and you have a cheering crowd behind you!! You can do it!!! I promise! I was taking pictures while running long before I had a blog. My friends used to laugh at me. What full are you running? “Everyone else chases PRs… I’m there for aesthetics”-> Ha! A good throwback to think back to the last big step up. Comparing the 10k to the Half makes sense… and the bundle of emotions will be similar. But James will have you so well prepared… just get to that start line healthy and you will get it done. 🙂 MCM is pretty huge as well, so you’re prepared for the size and craziness of hat race! Ohh, thank you so much Lynne! You always boost my spirits immensely! I run for the scenery too! I just did a 10-mile race and the only reason I signed up was because it was such a scenic course in Newport, RI. I’m a novice runner myself, so I’ve been there with the nerves and wondering if I can do the distance. Keep running & writing! Thank you so much! I just love race courses… you get to see some amazing sights!! Look at how far you’ve come in just a few years! You’ve got this! I remember when I lived in DC and thought anybody who ran the marathon had to be crazy. Just didn’t see the interest in doing something like that! Ha! Now I wish I could go back just to run it!! It will be great and you will love it !